Maya Bazar is regarded as the master piece of Sri Venkateswara Natyamandali (Surabhi). 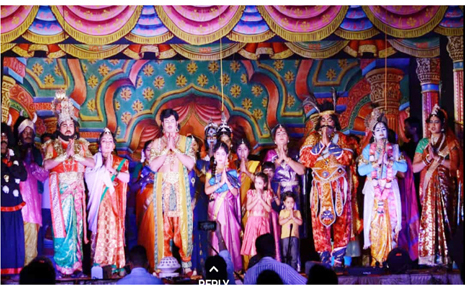 This production narrates the love story of Sesirekha, (the daughter of Balarama) and Abhimanyu (the son of Subhadra). The king Balaram wants to marry his daughter to his nephew Abhimanyu. But Balaram’s wife Revathi, under Narada’s influence, plans her daughter’s marriage with Lakshmana Kumara (son of Dhuryodhana). Due to the pressure from his wife, Balaram rejects the proposal to marry his daughter to Abhimanyu. Dejected, Abhimanyu with his mother Subhadra goes to meet his father Arjun in ajnathavasa (exile). While Abhimanyu and Subhadra is passing through a forest, they come across the demon king Gatothkacha (son of Bhima and Hidimba). Gatothkacha invites Abhimanyu for a fight, but through an intervention by Subhadra, he comes to know that Abhimanyu is his cousin and he takes them to his house. Ghatothkacha finds out about Abhimanyu and Sesirekha’s love and the reluctance of Balarama to the marriage. Ghatothkacha takes his oath to get them married. He goes to the city Dwaraka and requests Krishna for assistance. Now, with his magical powers, Gatothkacha kidnaps Sesirekha and disguising himself as Sesirekha, marries Lakshman Kumar. Later, Balaram repents marrying his daughter to Lakshman Kumar instead of Abhimanyu. On Krishna’s suggestion, he goes to meet Ghatothkacha and apologizes to Abhimanyu, Subhadra and Ghatothkacha. Then he gets his daughter married to Abhimanyu.